“We’re in the interoperability business, and we like having data being more available and more liquid, and systems being more open to getting data out of them,” said Woodlock. In one, NY Care Information Gateway, a New York City and Long Island-based regional health information organization, is using HealthShare technology to run its master patient index, with its matching algorithms to closing gaps in care. The tool has helped NYCIG sync and de-duplicate patient records, enabling the sharing of real-time updates to the state’s master patient index and boosting care coordination efforts for the network’s provider customers. That’s helped them boost quality improvement efforts, lower readmission rates and increase reimbursement rates under value-based care. With its new Essential Alerts project, clinicians can get notified when their patients are admitted been admitted to the EDs at most area hospitals with chest pain complaints, for instance, even if they haven’t given express permission for it. The alert is limited to the patient’s name, initial symptoms, hospital, date, and time. That’s enabled a big increase in the number of alerts fired, giving physicians more valuable insights into their patients’ care while still complying with New York privacy laws. Both HIE projects depend on finely-tuned algorithms, and as artificial intelligence continues to mature, Woodlock says the potential for them and others like them to further improve care coordination and population health management is big. Patient matching is an obvious and compelling place to start, and is “ripe for artificial intelligence to help out with,” said Woodlock. “You can watch a person go through that, look at essentially the features of the two potential patients to see whether they match or don’t match, and eventually learn the relationship between the features of the patients and whether they should be matched or not. There’s a lot of there’s a lot of very good artificial intelligence use cases that aren’t necessarily getting into care decisions. But even using the existing version of the technology, NYCIG, whose network serves millions of patients at hundreds of provider organizations in the New York City area, has been able to realize some notable gains as they navigate value-based reimbursement, said Woodlock. NYCIG is using the technology to help do just that, and another Healthshare Customer, Rhode Island Quality Institute, has reduced its own readmit rate by 15 percent, he said. For another example, he pointed to the fact that practices linked to NYCIG improved data on the care delivered to their diabetic patients. Many of them, for example, were able to discover that their patients weren’t just getting A1c tests with them, but with other providers too. 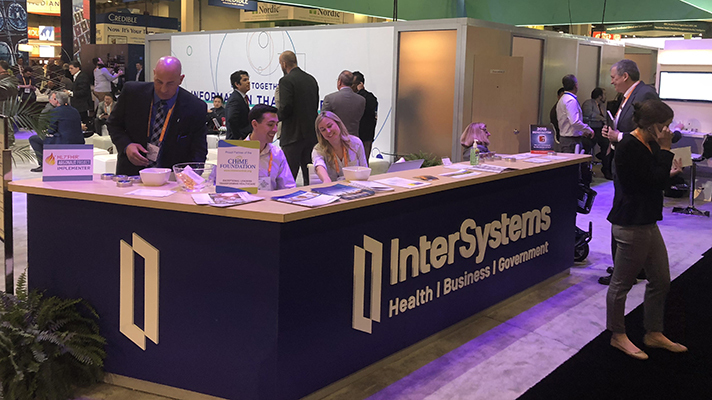 Healthix is one use case where AI and machine learning are at work, via InterSystems partner HBI solutions – which is helping the HIE’s customer realize the benefits of advanced predictive analytics. “We do the work of aggregating and normalizing and deduplicating the health information across multiple sources, and what they do is leverage that data and build machine learning models that predict the likelihood of occurrence of many things happening in the next 12 months,” said Woodlock. “They can predict for each patient the chance that that patient will be readmitted, will go into the emergency department, will get diabetes, will have a suicide attempt, will have an opioid problem,” he said. For example, a hospital might be able to see from the AI-powered analytics that a patient who presents at the ED with a broken bone also happens to have a 70 percent chance of getting diabetes, he explained. “You may then have a different conversation with the patient than you would otherwise, now that you know that,” he said. The predictive alerts also offer a weapon against the opioid crisis, since “part of the behavior of people that have this addiction is they visit a lot of different EDs at a lot of different health systems, and it’s very hard to put the puzzle together,” said Woodlock. Healthcare IT News is a publication of HIMSS Media.